During your judging process you need to keep track of which of your judges have finished reviewing their assigned submissions vs who may be lagging behind. We have two effective screens that you will be monitoring quite a bit to help give you an overview of your judges' progress. 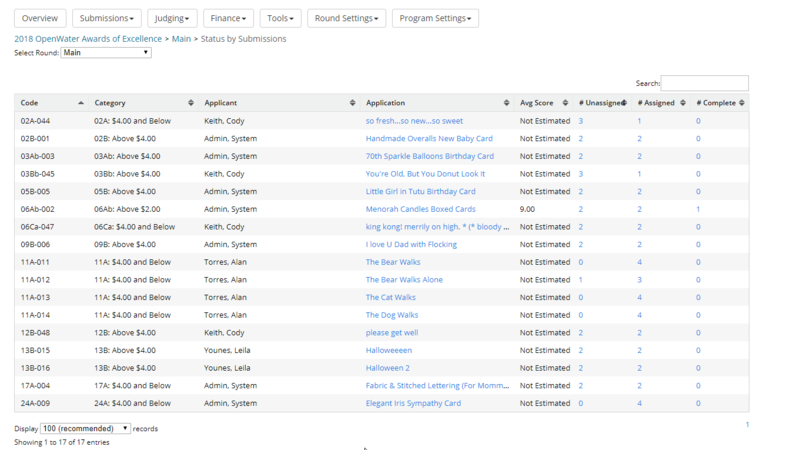 To view the status by judge, first navigate to your program. Under the Judging drop down menu, click View / Add Judges. This is the screen you will be spending most of your time on. You can view each judge, how many submissions they have been assigned, and how many of their assigned submissions they have completed reviewing. You can search and sort the columns in this table as well. You can also export this table to excel by clicking Export. The other judging view that you may find helpful is View Status By Submission. Under the Judging drop down menu, click Status by Submission. This screen will show you the submission, how many judges have been assigned to that submission, and how many of those judges completed their review. It is also handy to click and see which judges are assigned to that submission as well.